There are various options for the installation of PERFO ground reinforcement products, depending on the application and existing ground conditions, which must be taken into consideration. 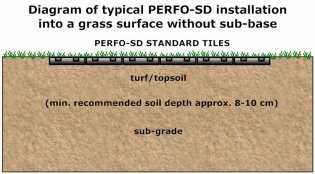 In many cases it is possible to compact the PERFO tiles directly into grassed soft ground. When PERFO is to be laid directly on the existing grass surface, the grass should be cut as short as possible beforehand. Small undulations can be levelled out using topsoil or a sand/soil mixture (20:80). The PERFO sections are laid out in position and clipped together using foot pressure row by row. Installation should only take place when the ground is soft enough to ensure the sections can be compacted into the surface easily and completely. Installing in either dry or very wet or muddy conditions should be avoided. In cases of extreme water-logging, very soft or uneven ground, or where heavy loads and/or frequent traffic are expected, some drainage is advisable and some ground preparation or foundation may be required. The top turf can be removed and a sub-base between 10-40 cm deep (depending on intended use) prepared. This should be levelled and compacted. If necessary a levelling layer of sand approx. 2 cm deep can follow. Finally, a layer of topsoil or a sand/soil mixture (20:80) of approx. 8-10 cm lightly compacted depth is added (quality grass seed should be mixed in with the sand/topsoil). A membrane may be used between the bedding layer and sub-base. 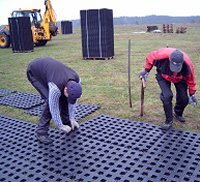 Row by row, the PERFO mats are placed in position, joined together using foot pressure on the clips and compacted into the prepared area. 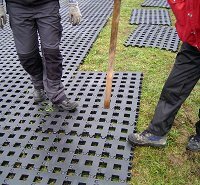 On ground that has been disturbed or levelled we strongly recommend that some grass growth is established before installation of the matting as this provides for the best stability and grass coverage. 6-8 weeks growth, sometimes less, is generally sufficient. To save time on newly prepared areas, PERFO matting can also be compacted into recently laid turf. PERFO-AK can also be compacted into a 10 cm bedding layer of crushed stone. The surface should be levelled and lightly compacted and the top layer moist when the PERFO is installed. 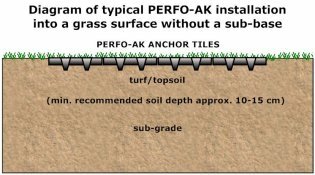 PERFO-AK tiles can also be dressed with a top layer gravel or soil after installation and re-sown with grass seed. PERFO-EQ is usually covered with a top layer of footings such as riding sand or sawdust, for example for the construction of riding arenas. The ideal method to be used will depend on the prevailing ground conditions, size and shape of the area to be installed. For PERFO-SD a tandem vibrating roller (min. 3.5 - 5 tonnes or heavier) is the best option. On gravel or soft ground (eg. after levelling/grading), a heavy duty compactor plate (approx. 750 kg) can be used initially. Motorised tampers/rammers are ideal for smaller areas. 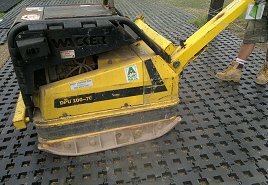 With PERFO-AK rammers or a wacker plate should be used initially to bed the tiles into the surface. The tiles can subsequently be rolled. 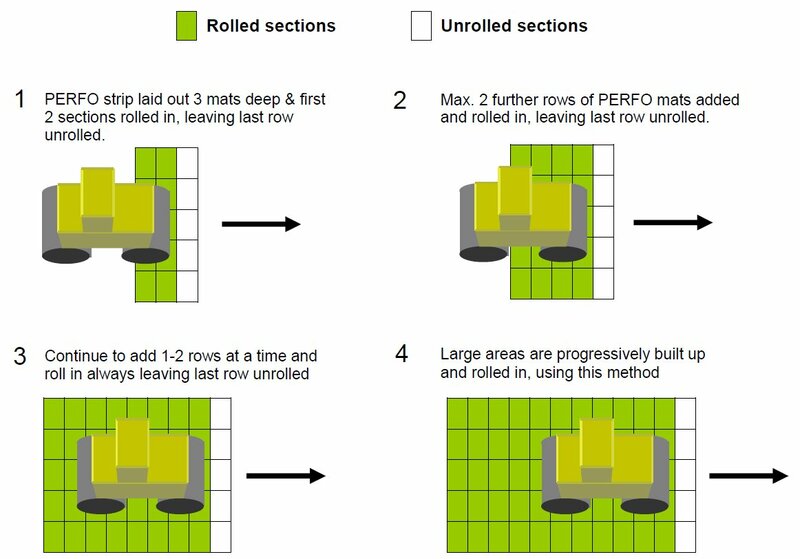 The last row of mats should be left unrolled at the end of each pass, to which up to a further 1- 2 rows of PERFO matting can be attached (see diagram below). 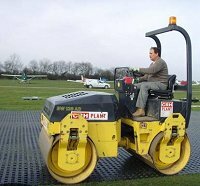 When rolling, it is important that not more than 3 rows of PERFO mats are laid in front of the roller, otherwise sections may bunch up and form a wave when rolled, making the compaction process more difficult. The individual PERFO elements are specially designed with expansion tabs to allow for expansion during hot temperatures. Therefore, care should be taken when rolling or compacting the PERFO sections into the ground to ensure the tiles are not pushed completely together and that a small gap between each element remains. The PERFO matting should be rolled in slowly "with the grain" in a straight line. Turning or abrupt braking or changes of direction should be avoided initially. After each pass, the position of the roller should be offset sideways for the next pass, while maintaining the general heading. The PERFO matting must be completely compacted into the ground for correct installation and to provide the optimum load bearing capabilities. Insufficient compaction may subsequently lead to rutting and an uneven surface developing once the area is trafficked. Note: if the tiles are not laid correctly or laid against immovable objects such as posts or curbs which could prevent expansion, this could result in small undulations forming during hot weather or extreme frosts. We therefore recommend that an expansion gap of approx. 2 cm should remain between the tiles and any immovable object after rolling/compacting. If necessary the tiles should be cut to allow for this expansion gap. PERFO tiles are supplied pre-assembled into pallet sized mats. 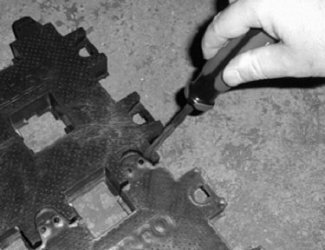 Individual tiles can be separated from neighbouring tiles (for example to achieve a specific width) by simply levering out the clips from above with a medium-sized flat screwdriver (see photo). Tiles so removed can then be re-attached in another position if required. Angles or curves can be achieved by progressively offsetting rows of tiles by one interlocking clip at a time. To meet exact width requirements or if irregular shapes or edges are required that cannot be achieved by offsetting the connecting clips, PERFO tiles can be easily cut using a saw, angle grinder or disc cutter. 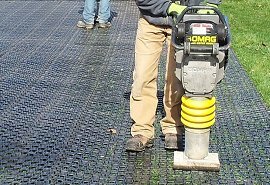 In the first few weeks after installation, the PERFO matting should be checked regularly to see that they remain flat and fully embedded in the surface, especially where there is little grass, after a ground frost or very hot temperatures. If there has been some initial movement the area can be rolled or compacted again. Once sufficient grass has grown back through the tiles, this will further strengthen the bond between the PERFO matting and the ground which should prevent further undulations or movement occurring and provide the best stability and load bearing capabilities. Subsequently it is good practice to roll the reinforced area at intervals (eg. annually) to correct any slight unevenness and ensure the ground remains well compacted. Grassed areas reinforced with PERFO can be mown as previously with standard mowing equipment. If the grass cuttings are not collected, they will build up on the surface over time. In some cases, after a period of time which can vary depending on use and ground conditions, a layer of soil and vegetable matter may gradually build up on top of the PERFO matting. If this becomes excessive it can be removed from small areas by scraping off manually, or mechanically from larger areas using agricultural yard scrapers, turf cutters or similar machinery. We can provide additional information on the various methods which can be used. In areas with poor drainage that are heavily trafficked when waterlogged, it is possible that some areas may become undermined over time with low spots forming. This may encourage further pooling of water and an increase in the problem if not dealt with. In such cases, bark chips can initially be used to absorb excess moisture and reduce mud. For a long term and effective solution the PERFO tiles in the affected area should be temporarily removed and the low spots filled with compacted gravel and a mixture of new, well draining soil/sand before replacing the tiles. In extreme cases, additional drainage should be considered. S2T Group additionally offers an installation training service and on-site guidance for the local installation team. Please contact us for a quote for this service or if you have any other questions relating to the most appropriate PERFO product and installation method for your particular application. As ground conditions, installation procedures and intended use of the PERFO system vary from site to site, we cannot accept any guarantee for suitability of the system for a specific application. For this reason we also cannot accept any liability resulting from use of the PERFO system. We recommend that adequate trials are undertaken by the customer, to ascertain the product's suitability for the particular application in question.